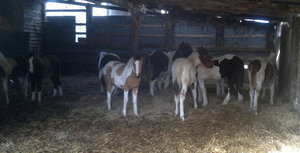 Well for a change today went as planned, foals all weaned, so 10 of them happily in yard together. they don't seem too bothered and neither do their mums, there was a bit of neighing for a while but all quiet now. You usually begin to find out who are the monkeys quite quickly, straight away Lulu was trying to prove that although she is the smallest nobody was going to bully her. By this evening she had settled down though. Tonight was their first taste of hard feed, Leonardo and LaKaisha have been eating hard feed for several weeks so they showed the others how it was done, they will soon be fighting over it !! Have called the vet and he is booked to come on 22nd to microchip and give first vaccinations. Then I can get passports applied for and they can start to go to their new homes, I know the new owners will be getting excited now. Must admit these are a big bunch of babies, Lancelot is huge and for having quite a small Mum Lola is a proper chunk. The next days I love, getting to know them all, staying in the yard with them to see who the bravest are, Luigi, Lola and Leonardo already like a cuddle and a scratch so will see who is next to see how nice it is once they trust us frightening humans.